Carnival Cruise Line today announced the diverse inaugural schedule for the totally transformed Carnival Radiance, including 9- to 13-day European voyages, the line’s first to Cuba from New York and Norfolk, four- to nine-day sailings to the Caribbean, Canada/New England from New York, and a winter season of voyages to the Caribbean and Cuba from Port Canaveral, Fla.
Additionally, the company revealed details of Carnival Sunrise’s 2020 schedule, including an expanded series of New York to Cuba cruises, as well as four- to nine-day voyages to the Caribbean from New York and Norfolk, Va. Following a $200 million dry dock that will take place in Cadiz, Spain, Carnival Radiance will debut April 29, 2020, with a 10-day Mediterranean sailing from Barcelona followed by nine-and 12-day departures visiting top destinations throughout the region, including Italy, France, Croatia, Greece, Malta and Spain. The ship will then embark on a 13-day trans-Atlantic crossing from Barcelona to New York June 11-24, 2020, positioning the vessel for its inaugural season in the Big Apple. Once in New York, Carnival Radiance will offer a series of four- and six-day Bermuda cruises as well as a four-day cruise to Saint John, New Brunswick, eight-day eastern Caribbean voyages and the line’s first Cuba cruises from New York – nine-day sailings that include a full-day and overnight stay in Havana and two Bahamian ports of call. The New York program will conclude with a series of Canada/New England voyages featuring stops in Boston, Portland, Saint John, and Halifax. The ship will also offer four five- to seven-day voyages from Norfolk in October and November 2020, including the line’s first Cuba cruises from that port. The week-long Cuba cruises will feature an extended stop in the capital of Havana along with visits to two tropical Bahamian ports. There will also be a five-day Bahamas cruise and a six-day cruise visiting three of the country’s most popular destinations, including the private island of Half Moon Cay. Following the cruises from the Northeast, Carnival Radiance will reposition to Port Canaveral, Fla., to operate a winter schedule of six- to eight-day voyages to the Caribbean and Cuba beginning Nov. 8, 2020. The program includes six-day voyages featuring a day-long visit and overnight call in Havana and two Bahamian ports; a six-day sailing to Grand Turk, Amber Cove, Dominican Republic and Nassau, The Bahamas; and seven-and eight-day Caribbean voyages visiting some of the region’s most popular and beautiful islands, including Aruba, Curacao, St. Kitts and Grand Turk. Building upon the popularity of short Bermuda cruises introduced on Carnival Horizon, Carnival Sunrise will offer a series of “long weekend” getaways to Bermuda as well as longer length Caribbean voyages and cruises to Cuba from the Big Apple beginning May 21, 2020. The program includes eight, nine-day voyages to Cuba featuring a full day and overnight call in Havana along with stops at the private Bahamian island of Half Moon Cay and Nassau. Eight, four-day “long weekend” voyages to Bermuda will also be offered, departing Thursdays and returning Mondays and spending a full day on the island. Seven, eight-day voyages visiting beautiful ports in the Caribbean and Bahamas will be offered as well. The program concludes with a 12-day Carnival Journeys partial Panama Canal transit from New York to Fort Lauderdale Oct. 19-31, 2020. 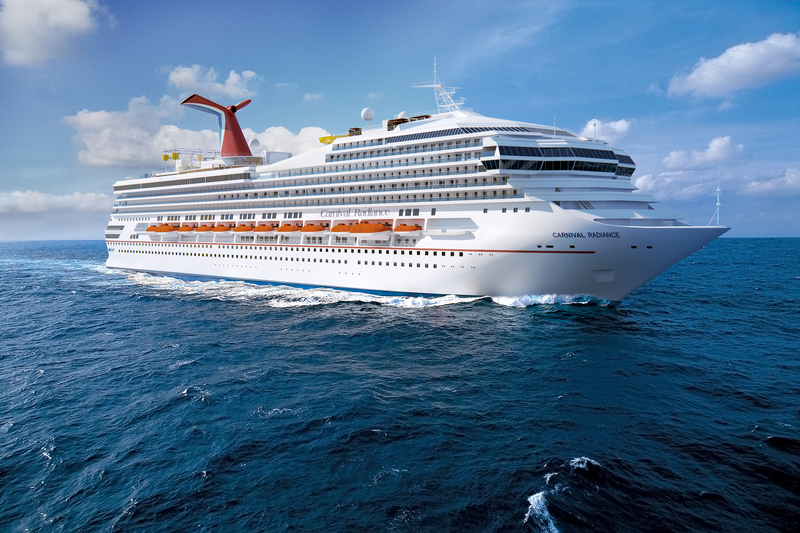 Carnival Sunrise will also sail from Norfolk, Va., in May 2020, offering a pair of five-day cruises to Nassau and Freeport, along with a three-port, six-day voyage featuring Half Moon Cay, Nassau, and Freeport. Carnival Sunrise and Carnival Radiance will each undergo extensive dry docks in 2019 and 2020, respectively, that will add an array of exciting food, beverage and entertainment choices. New culinary and beverage offerings will include Guy’s Pig & Anchor Bar-B-Que Smokehouse developed by Food Network star and longtime partner Guy Fieri, a classic American steakhouse called Fahrenheit 555, and the Cucina del Capitano family-style Italian restaurant, the Caribbean-inspired RedFrog Pub. Carnival Radiance will also feature Big Chicken, a seagoing version of a landside restaurant operated by the line’s Chief Fun Officer, NBA Hall of Famer Shaquille O’Neal. A sprawling new WaterWorks aqua park featuring the new AquaTunnel slide as well as a SportSquare open-air recreation complex with a suspended ropes course will be added, as well. All staterooms will be renovated with a tropical color palette reminiscent of the ships’ Caribbean itineraries. To make a reservation, contact any travel agent or call 1-800-CARNIVAL. For more information, visit Carnival.com. Carnival can also be found on: Facebook, Instagram, Twitter and YouTube.